However, there is a second, more down to earth story that secured it name in English culture. In the 1500’s, a single specimen of Helleborus niger that was found growing in an English abbey that was believed to have been established by St. Thomas, one of the Twelve Apostles of Jesus Christ. Under the old Julian calender, this hellebore bloomed near to January 6 which in those days had been the date for Christmas Day. So when the Gregorian calendar was first introduced to England in 1588, and Christmas Day was moved to 25th December, the flower did not bloom at the expected time! It was seen as such a terrible omen that England chose not to adopt the Gregorian calendar at that time and had to wait until it was re-introduced 1751. But I digress, the Christmas rose is a hardy, evergreen perennial which can produce an abundance of pure white flowers, although occasionally they are tinged with pink. So to summarise, it has green leaves and white flowers. So where does the species name ‘niger’ meaning black come from. Furthermore, the Christmas rose has a second, popular common name which is the Black Hellbore! It turns out that the black part of its name actually refers to its roots. The generic name of this plant is derived from the Greek elein ‘to injure’ and bora meaning ‘food’, and indicates to its highly poisonous nature. 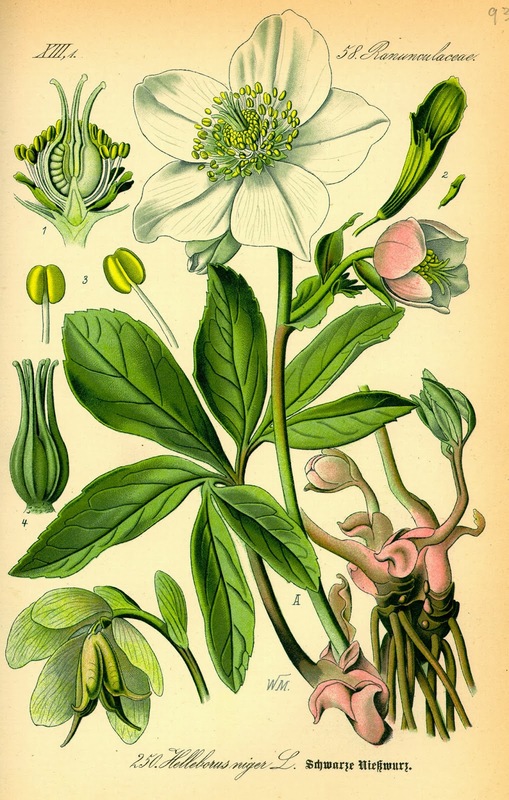 In the early days of medicine Black Hellebore was used by the ancients to treat paralysis, gout and particularly insanity, among other diseases. In the wrong hands though, Black Hellebore can be an effective poison. Small doses will cause tinnitus, vertigo, stupor, thirst, and a feeling of suffocation, while a lrger dose can cause swelling of the tongue and throat, emesis and catharsis, bradycardia (slowing of the pulse), and finally collapse and death from cardiac arrest.